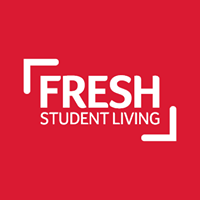 Fresh Student Living is a leading student accommodation provider in the UK. Abbey Lodge Student Village is one of the newest additions to our portfolio. The site itself is located off of Uttoxeter New Road and our Marketing Suite is located on the Wardwick. With a great selection of rooms in shared apartments with prices from £80 per week including all bills, contents insurance and internet, free on site car parking and a complimentary bus to University. You’ll also have access to our great social space equipped with a TV, a pool table and table tennis as well as our brand new outdoor sun terrace. Pop in to see us at the marketing suite to see a sample room and find out more information from our friendly team. Terms and conditions-Limited availability. £200 cashback will be paid after the first rent instalment has been paid and Tenancy Agreement and Guarantor Agreement signed. Offer is only valid on refurbished rooms and cannot be combined with any other offer or semester lets and may be withdrawn at any time. Valid on a limited number of bookings until 31st August. When the maximum number of discounts has been reached the offer will be withdrawn.